Hello dear readers and fellow A-Z participants. It's day four of the blogging challenge and I'm continuing my blogging tips by talking about how to schedule your posts. I know it's a bit of a stretch for the letter theme, but I couldn't fit this topic in anywhere else. I've taught a couple of social media classes before and been surprised at how many people are unaware that you can schedule your blog posts ahead of time. It's great because you write it, then it posts consistently. In my experience, this consistency has given me more comments. I actually wrote this post on March 5th. I'm getting ready to pitch my book at a writers conference in two weeks so I don't have time to write posts right now. See how nice that is? So, How do you schedule posts? 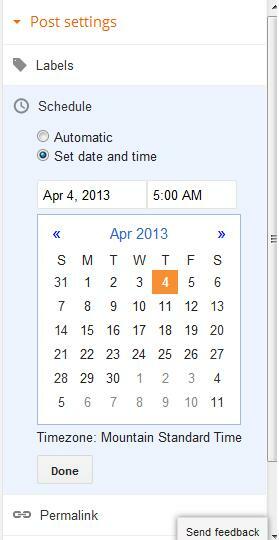 It's simple - when you draft in the right sidebar, you select Schedule, pick your date and time then click done. Now your post is ready to go, and you don't have to freak out by trying to write posts the day of. Easy peasy and stress free. Have fun posting! I pre-schedule all of my posts and usually at 5:00 am EST. (I'm posting a little earlier this month due to the Challenge.) I can't imagine getting up early in the morning and trying to put together a blog post! Excellent post and idea. I started Doing it ahead of time, but now I'm slacking like always! I always schedule things like guest posts etc but a lot of the time it's just as and when. I can't schedule anything during my Challenge so it's just whenever I get it ready in the morning. I'm finding it exciting though! Ys! I love scheduling posts. But I need to get waaaaay better at it since I've been so horrible at blogging. What with all the medical tests I've been going through this week, and winding up quite sick with this insipid cold, I'm very happy to have scheduled posts through today. I have several more written and will load them after my next doctor visit. Scheduling posts has made blogging life so much simpler. So, not that my blog is for anything but keeping up with family and friends that are far away, but I have learned so very much from you. Thank you!! This is the only way I can survive the A to Z challenge, lol. Yes, posting ahead of time is crucial in the A to Z challenge, but I never do it. I'm always afraid that the world will collapse and I'll need to change something in my post. Wow, how organized:) I try to do the same, but it only works half the time. I tend to like to feel things in the moment and write whatever I'm feeling on that particular day. I always schedule my bloghop posts ahead of time. Sometimes I just post whatever is on my mind whenever I write it, lol. But with A to Z, gosh, ALWAYS schedule these babies. Most of my posts are pre-scheduled these days, though sometimes I've had to re-schedule posts if something like a bloghop comes up. It makes it so much easier when a post for a weekly bloghop is already taken care of well in advance. I wrote all my A-Z posts in advance last year, and this year all but my X post have been written in advance. It was for my first A to Z that I learned how to schedule posts. So useful! It's very important to schedule posts, especially with a blogfest of this magnitude. I just have a bunch of drafts saved that I went back and posted at a later time, but this seems to be so much easier! Def posting ahead for A to Z, but in real life (not A to Z madness) I like to be a little closer to my material, and usually write and post the same day. I wrote most of my posts ahead of time and posted them the day I chose. But for the A to Z blog I didn't want to worry about what time I would eventually get around to being able to post. I didn't realize you could schedule them until I read about it in one of the posts I read last month. It still took me to the end of March to figure out how to schedule ahead with Wordpress. Now that I have I love it. It is so much easier! I like to plan out my posts because I want to make sure what I have to say or share is useful to others. Posting ahead is great, but different platforms look different. 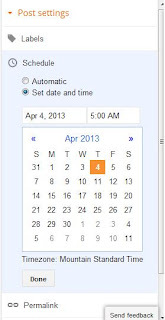 In wordpress you edit the time to be posted. I have scheduled posts ahead of time, like if I'm going to be out of town. But I don't know if it's because I'm such a control freak, or because I don't trust blogger, or what, but if I'm aroudn, I'll find myself hitting the publish button minutes before it's scheduled. Kinda defeats the whole purpose, lol. Been doing it for a few months now and yet it's easy and stress free. Yup. AtoZ was set to go in March. I usually check on the post the night before if I get a chance, just to make sure I really finished it! I even have one done for my anniversary in September, ready and scheduled to go up. It's a really good deal, I think! Write when you have the time, post when you don't!